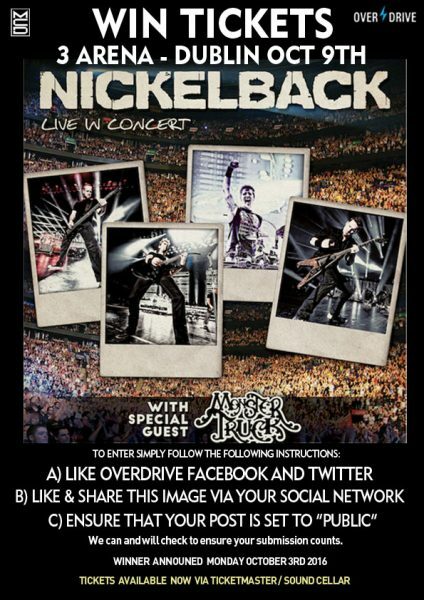 NICKELBACK – WIN TICKETS FOR DUBLIN’S 3 ARENA! Multi-platinum selling rock band NICKELBACK are set to embark on a massive headline tour in 2016. Starting in Helsinki, Finland on the 2nd September, with support coming from fellow Canadian rockers MONSTER TRUCK. Overdrive will be giving away a pair of tickets to one lucky fan! Get all the details below. This tour marks NICKELBACK’s tenth world tour and will see the band performing in 32 cities across Europe this Autumn, including shows at both Dublin’s 3Arena on October 9th and Belfast’s SSE Arena on October 10th. Tickets are on sale NOW and are available from Ticketmaster outlets nationwide and Dublin’s Soundcellar. Tickets for Dublin from €60.59 and Belfast from £40.70 including booking and facility fee from Ticketmaster outlets nationwide and online at www.ticketmaster.ie. A charity donation of €1/£1 from the Dublin and Belfast concerts will go to ‘All The Right Reasons Foundation’. In addition to membership gifts, exclusive giveaways and content, individuals that join the fan club will have first access to tickets. 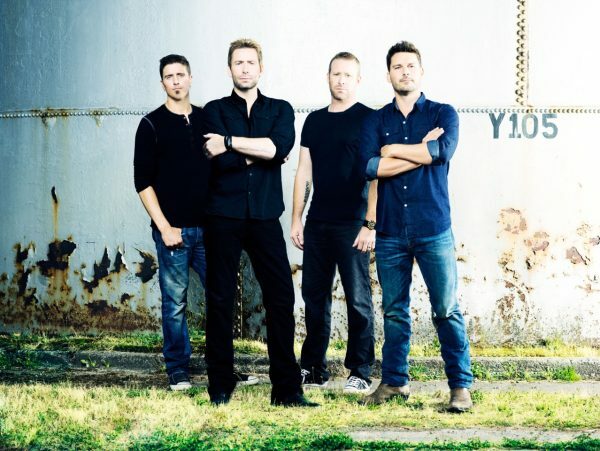 For additional information on joining the fan club, visit www.nickelback.com. Check out the video below of Nickelback’s Eastern European tour which is currently taking place right now! NICKELBACK have cemented themselves as one of the most commercially viable and important acts of the past two decades. The group’s worldwide sales exceed 50 million units and their irresistible smash “How You Remind Me” remains Billboard’s “Top Rock Song of the Decade”. Amongst all of these accolades, they’ve been crowned Billboard’s “Top Rock Group of the Decade” as well. Along the way, they’ve received a staggering nine Grammy Award nominations, three American Music Awards, a World Music Award, and a People’s Choice Award. In their native Canada, the band have garnered 36 JUNO Award nominations of which 12 won in a variety of categories and have been inducted into Canada’s Walk of Fame.